October has not been kind to Juneau, weatherwise. The last dry day was Sept. 25, which was the day I left on my Golden Circle bike tour. It seems like ages ago. Since then, we've set a number of disappointing records ... daily rainfall records, consecutive days of rain, high wind speeds. We're still pace for a record number of wet days for the year (Up to 211 right now, but who's counting?) Complaining about rain in Juneau is like complaining about sand in the desert. But it would be a lie, I believe for any of us here, to say that waking up to the 34th consecutive day of dripping gray fog doesn't make us feel like eating a few thousand calories of pure carbs and crawling back into bed. So my point is, after a streak like that, when the sun comes out, it matters. It more than matters. It nourishes. Like fresh bread and butter after a long fast, the long-hidden rays soak into skin and fill every cell with warmth and light. So when I woke up on Thursday to a clear day that I wasn't expecting, I knew it could only mean one thing - binge, binge, binge. I took Pugsley up the Perseverance Trail. A couple of days ago, the bottom bracket started clanking and it got worse quickly. I know I'm gambling by riding this bike when the bottom bracket could crack in half at any second. But I figure the worse that can happen would be me becoming stranded. And what better day and place to get stranded than here? But I didn't feel comfortable with the idea of riding a clanking, ailing bicycle for six hours, so I parked Pugsley and set out on foot up Granite Creek canyon. I wasn't planning on hiking, so I didn't have snowshoes with me. The snow quickly went from ankle-deep to knee-deep to thigh-deep. It was a huge, strenuous slog just to move slowly through it. The snow was crusty and heavy but highly collapsible - sort of like walking through shaved ice. I'm not even sure that snowshoes would have helped, because they likely still would have punched through and then become stuck in the postholes. Skis with good skins would have definitely been better - if I owned any. As it was, there were enough open stream crossings and bushwhacking that even the death sticks would have been difficult. It's all good, though. Any activity that's excruciatingly slow and needlessly difficult is great Iditarod training. But, yes, Granite Creek Basin is a magical place and worth the slog. Hard to describe and impossible to photograph, but I love the way the ridge wraps itself around the valley like a chiseled fortress. And the snow. Oh, the snow. It was still crusty even higher on the mountain, and whipped by an intensifying wind, but I still wished I hadn't forgotten my snowboard, too. But the sun. Oh, the sun. I started to struggle when I was climbing toward the upper basin. There were steep pitches with no way around, and the wind chill was becoming a concern. When I left the house at 9:30 a.m. it was 35 degrees. But up in the basin it felt so much colder. It seems illogical that there would be that much difference in temperature, but I was convinced the temperature with windchill was well below zero. Could be that it's just early in the year and I don't have my cold blood running yet. But what matters is I was cold and that's why I turned around. On the way down, I had an odd mishap. I was tracing a diagonal path, just above my original steps, down a steep pitch when I planted my right foot in a rotten patch of snow and sank all the way up to my waist. In my original struggle to extract myself, I managed to compress all of the snow around my boot until it formed an icy block. I'll admit there were a few moments of mild panic when I finally realized I was stuck. I knew I could tug my foot out of my boot to free myself, but I very well couldn't hike all the way down the mountain with only one boot. At least, not without losing a toe or two. But I pushed through the panic and formed a plan. I carefully pulled my leg out of the boot and spun my body around, laying on my stomach and holding the sock foot in the air. Then I used my mittens to dig a trench around the outside of the posthole, careful to remove the snow rather than push it over the boot. When I got down to boot level, I widened the trench until I could leverage my body and punch out the ice-snow barrier around the boot. The anxiety-filled process took at least 15 minutes, but when I finally freed the boot, I was so happy. It was the best part of the day. After that, I was careful to only step in my own footprints, despite the ankle-twisting risk, until I made it back down to the basin. After that, it was a relaxing hike back down, with a little bit of elation about the genius way in which I conquered the boot-eating snow. Then I rode back to town. The roads were bathed in direct sun. Everything felt so warm. Even though I was tired and hungry, I took off my extra layers, turned my bike away from home and rode north for a while, just to soak it in. I didn't think I was going to ride today, but then I read Elden's blog. Most people who browse this site also read fatcyclist.com, so I don't need to rehash the details. But any entry with the title "Getting the ending right," in regards to cancer, casts a heartbreaking mood over the morning. I had been sitting at my computer, downing cups of coffee and trying to pull myself out of poor-sleep fatigue. I had already decided I was due for a "reward day." Reward days are the days that I let myself skip the waterlogged rides and/or hikes, put on something comfortable and cotton, grab a New Yorker magazine, and spend a relaxing and dry hour or two at the gym. Most of the time I love to go outside, but the rain and wind does start to wear on me, so every week or 10 days, regardless of what I had planned to do for training, I'll give myself what is essentially a rain day and hunker down inside. That was going to be today. But after I read Elden's post, something just felt empty about going to the gym. There were thoughts I wanted to process and memories I wanted to confront. I changed out of my gym clothes, put on several layers of fleece, pulled on my neoprene socks and gloves, and headed out the door. Hard rain fell from dark clouds and flowed around the decimated snow pack. The melt allowed me to ride my road bike, and I went out strong and fast, pedaling hard while squinting at the wet pavement. I was fixated on the movement and flow. My lungs burned and my legs ached. It's a tough place to ride, and a quiet place to think. I lost my great-grandmother to brain cancer about four years ago. She had lived a full life. She was about 80 years old. But the disease cut her down shockingly fast. I was busy with whatever silly things I was busy with in 2004, and I was only able to visit her twice. The first was in the hospital, when she was still laughing and joking. The second was after the family had already moved her home in the care of hospice. I sat down next to her bed and she contorted her face as she looked at me. Cancer had stolen her ability to string thoughts into words, and she spoke in incoherent babble. Her eyes were filled with terror, and my mom told me that she probably no longer remembered who I was, and that she probably no longer even remembered who she was. The look in my great-grandmother's eyes said everything, and I was devastated. Here was this vibrant woman, the woman who let me eat grapes out of her back yard and who peppered me with great stories when I was doing my seventh-grade report on the Great Depression, a woman who I had known and loved all my life, robbed of her memories, her personality, her mind. I was in my mid-20s and thought I had long accepted mortality and the realities of cancer. But my great-grandmother's eyes, with their emptiness and fear, brought that reality into sharp focus - cancer is a disease so frightening it can make death seem kind. Death came mercifully fast for my great-grandmother. She was only with us a few more days beyond my final visit. I listened to distant family members, part of her enormous progeny, speak at her funeral. Their stories of happiness and love helped me realize that even if my great-grandmother left the world remembering nothing about her life, her family remembered and loved her for it. And that was important. For all of the people in our lives, whatever distant connections we have, it's important to learn, and to live, and to remember. Although we've been seeing snow in the surrounding mountains since mid-September, the actual city limits of Juneau weren't hit with snow until Friday night. Oct. 24 is actually a little early for Juneau's first snow, located as it is in the banana belt of Alaska. It means winter's not here to stay, but it's always fun to see white stuff before Halloween. Riding through 6-8 inches of fresh powder up a moderately steep trail is the best full-body workout there is ... you know, besides running, yoga, cross-country skiing, pilates and swimming. For the second day in a row, I came home coated in sweat with legs tired to the core after spending four hours covering 32 miles. Still, the downhill runs are amazing ... steamrolling down singletrack in a white powder blast, wheels nearly silent in the snow, bouncing over partially-covered rocks, carving wide turns with the fat tires, eyes streaming with tears in the cold wind, kind of like a happy cry. Downhill snowbiking is always the best at first snows, when the dirt base allows unchecked speed, but the soft powder muffles inhibitions. The rest of the time, you're moving slow enough to notice all the changes in your world. This is the spring-growth tree that I photographed the other day, looking a little forlorn. I don't think those baby leaves are going to last much longer, but I still admire the tree's effort. And a single sun shot to part with. Now, back to rain. It's been a good week for Pugsley. Not only did I recently promise him many, many hours of quality training time this winter, but the hurricanes that deluged Juneau in rain dumped a fair amount of snow in the mountains. There was even a small break in the weather today. Time to head up. I saw the sun bursting through this small sucker-hole near the base of Eaglecrest Ski Area and actually stopped for a few minutes just to stand in its path. It's the first hit of direct sunlight I've had since I walked out of the Grand Canyon on Oct. 11. The snow conditions were predictably bad - dense powder covered with a thin layer of wind-scoured ice. Beautiful when I could stay on top, but mostly I just sank in. The riding became much better atop the mid-mountain fields, where I managed to stay on top of the crust for healthy distances. The swamps and bogs were frozen solid. Large blocks of new terrain had opened up overnight. This is what I love about winter cycling. The regular barriers of mountain biking break down. But winter cycling is also harder. I always forget just how much more time and effort the exact same routes can consume in winter compared to summer. I guess it makes sense - heavy bike, wide tires, bulky clothing, cold temperatures. But it's almost more than that, and it's difficult to describe. It's like, if summer cycling were like skipping along the beach, winter cycling would be like skipping along the beach just off the shore in waist-deep cold water, with quicksand under your feet. Oh, and there are sharks swimming around. It's hard. Maybe I'm just not used to it. But I love it just the same. All afternoon I encountered intense snow squalls broken by calm periods of sunlight. Strange weather. After checking out the open terrain near the road, I left Pugsley at the top of the ski lift, about 3,000 feet up, and hiked to the ridge. A storm moved through shortly before I reached the top, but I continued upward anyway. As soon as my head peaked over the final horizon line, I was hit with a windchill so intense that it took my breath away. I just wasn't expecting such an extreme shift in temperature. The upper crust was covered in fascinating rime formations, but I didn't take any pictures because I was somewhat worried my hands would flash freeze if I removed my mittens. It was a white-out anyway. Quickly down I went. Not long after that, the storm moved through and it was beautiful again. I stuffed that balaclava in my Camelbak almost as an afterthought. I was lucky to have it, because that PVC rain jacket and my wet wool socks really weren't pulling their weight. It continues to be tough to dress properly for longer rides this time of year. It was still raining at sea level. But tonight, as we were having dinner with friends, the snow moved low and already there's a couple of inches on the ground. Good things to come. A good time to be Pugsley. While riding along Perseverance Basin, I saw this tree, stripped nearly bare in an April avalanche, sporting its first sprigs of new growth. The blueberry bushes and alder branches surrounding it, only recently uncovered from the slow-melting avalanche debris, were rushing to do the same. It was an interesting scene - a futile burst of life in late October. All around, the Devil's Club had wilted. Brown leaves littered the ground. All the other trees were bare. But in the avalanche zone, it was spring. It was a little sad ... but inspiring, too - a reminder that life never stops trying. I have had a good week of fun little Pugsley rides, jaunts to North Douglas, and trips to the gym. It will be my last unfocused week. The real training will have to begin now. But the truth is, I'm not ever sure where to begin. I have a much stronger base than I had at this time last year. Hiking and cycling, healthy knees and strong legs. I have been trying to do more high-intensity work, but it's always hard to get into it. I can usually bust out a few intervals, until 50 mph wind gusts knock me sideways and steal the breath from my lungs, and rain daggers pierce my scalp and stab my eyes, and my fingers go numb in the wet cold and I no longer have the energy to wiggle my toes for warmth. After that, I'm just trying to stay on the bike. October cycling is not about fitness. October cycling is about survival. Some days - most days - it's just not worth it. I have been putting my gym pass to good use, in a place where I can run intervals that are actually effective workouts, without worrying about blowing off the road or nose-diving into some rainwater-filled pothole. This has been a week of strong wind advisories and heavy rain. Our storm total is nearly over 10 inches. Storm total! Single storm! It takes Anchorage about 7 months to accumulate that much precipitation. Combine that with the 50-60 mph wind gusts and in any Atlantic state you'd have a tropical storm. Here, it's just autumn. The forecast calls for more of the same Thursday. I may try to get out for my first "training" ride of the season - if only because, for all the intervals I can run, survival is still the most important skill I can hone. in my mind, in my mind. in my mind, in my mind ..."
I was going through some old picture folders when I found the original file of a photo I have had over in this blog's sidebar for a while now. 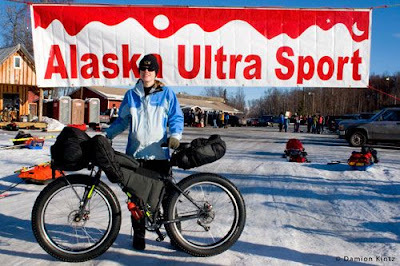 It was taken just a few minutes before the start of the 2008 Iditarod Trail Invitational by Damion Kintz (or at least, that's who the little copyright symbol in the corner attributes it to.) For me, this picture is filled with the nervous energy and hope that surrounded the moment. But more than that, I see the one of those pivotal moments that life is full of - a moment of innocence lost. The week following is still burned with startling clarity in my memory, and I think about it often. I think about the world of extremes, the beauty and the bleakness, the strength and the weakness, the highs and the lows. And I think about the what ifs. What if I had trained differently? What if I had different gear? What if I had gotten more sleep early on? What if I had eaten enough? What if I hadn't dropped my bike in Pass Creek? Would I have avoided the minor freakout and subsequent breakdowns that plagued me as I rode a wave of grace through the rest of that beautiful but brutal race? What if? And if so, what then? And then I got to thinking ... "Hmmm, it was about this time last year that I entered the 2008 race." Turns out, it was exactly one year ago. Time runs short. The Iditarod Trail has been in the forefront of my thoughts recently as winter approaches, changes loom and memories linger. I have wrestled with the possibility of entering the race again in 2009, but was never able to make a strong commitment. Last year, I nearly killed my poor family with worry. I spent a lot of money and burned up a lot of time in training. I made a lot of mistakes. And I wonder why I would subject myself to something so challenging and painful ever again. Even though I learned so much, and have so much more insight into the larger picture, and so much more insight into myself. Yeah, that looks like my hat, thrown in the ring. Recent discussions on my and Geoff's blog gave me idea for how to respond to the ever-circulating "Seven Random Things About Me" blog game, of which I was recently tagged by Carrot Quinn. So here's: "Seven Random Things About My Work History." 1. My first job was at Wendy's. I tried unsuccessfully for most of my sophomore year to land a job as a 15-year-old. So the day after I turned 16, I went into Wendy's under the recommendation of a friend and filled out an application. I told the interviewer that I appreciated that "Wendy's makes quality hamburgers, not crappy ones like McDonalds." (Oh yes I did say that.) I was employed within a week of my 16th birthday. I made $6.25 an hour. 2. I hated that job - not because it was a crappy fast food job, but because an unapologetic sexist hierarchy chained me to salad bar duty, which I despised. I wanted to work the cash register, and expressed that desire numerous times. My manager told me in so many words that he didn't want a girly handling the money. I quit and applied at Albertsons - gladly taking a $2-an-hour wage cut to work as a bagger for minimum wage. It was the first indication of one of my personality flaws: I don't really care about money, but I do like to work. 3. I worked two part-time jobs throughout college, logging about 45 hours a week on top of my classes. One of those jobs was a bagel baker at Einstein's Bagels, working Saturdays and Sundays from 4 a.m. to noon. Since I didn't want to miss out completely on the college experience, I often pulled all-nighters at friends' parties and clubs. When 4 a.m. rolled around, I'd leave the party and stumble sleepless into work, pulling an apron around the clothing I had worn the night before. I still think of baking at Einstein's Bagels as my first "endurance" sport. 4. My claim to fame at Einsteins was the creation of the "cinnamon twist," in which I braided raw bagel dough and drenched the sticks in cinnamon and sugar before baking. It was essentially a thick-coated cinnamon sugar bagel, but I stuck them on the counter and charged three times what a bagel cost. Those things flew out the door. I couldn't bake them fast enough. I was eventually reprimanded by the corporate managers for making something that wasn't part of the established menu. I could never forgive them for quashing my creativity. 5. I have been fired. In one of my second jobs in college, I worked a short stint as a film processor at a one-hour photo place called MotoPhoto. One night, I mistook a bottle of film cleaner for the bottle of water we usually used to clean the inside of the film processing machine. Overnight, the film cleaner combined with other chemicals corroded the plastic inside the processing machine, causing several hundred dollars in damage. For that I was fired. I was completely devastated about it. 6. Although I studied journalism and literature at the University of Utah, my first jobs out of college were as a graphic designer, a profession for which I had not taken a single class in school. I taught myself Quark Xpress, Adobe Photoshop and Illustrator in order to design a catalog for an art supply company I had worked for in retail customer service, but had been promoted upon receiving my degree. After that, graphic design pretty much stuck. I eventually found my way back into newspapers, but almost always as an editor/designer. 7. I have a strong work ethic but little ambition. It probably means I'll never belong to a high or even average tax bracket, but I hope it means I'll always have the time and energy to pursue the things I love. Well, Geoff is back in town now. Even after some discussion, I'm still not completely sure why he decided to return to Juneau after vowing he would not - at least, not until fall and a fair chunk of November and December were good and over. Juneau has given him its warmest welcome, too. The weather has been on the soft side of horrific. I'm not sure what it was like while I was in Utah, but I do know it pretty much hasn't stopped raining since the minute my Alaska Airlines jet lurched violently in a gusty crosswind just feet over the runway. Now we pretty much just wait for lulls in the wind to go out. "Oh, just 15 mph wind and drizzle? That's practically sunny." Yesterday, before three hours of cycling I misjudged how many layers I'd need and paid the deep and painful price. I noticed a chill set in as I was climbing and knew I was in for problems. I turned around before too long, but it was too late to stave off breathtaking windchill during the descent, followed by 10 miles of bucking that 25 mph headwind in my single soaked layer of neoprene/polypro and a pathetic rain jacket. Upon return, I had to curl up on my bedroom floor while my body worked through some incapacitating pain. Rewarming the extremities after deep, wet chills is horrible. I have to relearn this every October. Geoff has been experiencing some back problems and hasn't been running this week. Today he expressed interest in going for a hike, so we hit up Mount Jumbo. All was fine until we hit snowline, then I started to struggle. I was up there just 10 days ago, walking on dry ground under clear skies. Today we were plodding through knee-deep snow, still a few hundred feet below the peak. The snow was so wet that it seemed to be infused with some kind of oil - it was just super slick. After I crossed a narrow saddle, I slipped on a steep, rocky pitch and slid several feet toward the yawning abyss of a deep bowl. There were no cliffs nearby and the snow was deep and heavy enough to stop me before I slid too far, but I was sufficiently sketched out. I had announced to Geoff earlier that I would probably not follow him to the top, so I turned around right there. It was just as well. He caught me on my way down the mountain to report thigh-deep powder snow, a blowing blizzard, near-zero visibility and wind chills below 0F at the top. Another reminder that if you don't like the weather, just take a few extra steps - it can always get worse. It's not supposed to get much better, but I still have a few punches left on my gym pass. Thinking it's time to take a break from the Great Outdoors. I was grinding up a slick stretch of singletrack on Monday when the bike's rear wheel, unsurprisingly, finally refused to turn. I used a stick to chip away at a thick layer of mud crammed between the tire and the frame, but it was no use. The mass held as steadfast as concrete, and nearly as solid. A day of "warmer" temperatures and plenty of snowmelt had left the Draper trails wet and muddy. I headed out anyway, forgetting that those clay-packed trails in Utah become unrideable when wet, unlike the spongy trails in Juneau, which are always wet. Eventually I stashed the bike in some trees and started hiking up the Jacob's Ladder trail, which I remembered as a steep but scenic route that, on an ambitious day, eventually reaches Lone Peak - a peak that, before I moved to Alaska, I considered my favorite place in the whole world. I knew Lone Peak was out of the question on Monday, but it felt good to walk in its shadow. I hiked up the snowy trail until I met two other hikers - young, somewhat pudgy guys who looked like they were about 23 or 24 years old. They announced they were scouting out the route for a planned Boy Scout campout up in the alpine cirque (some 3,000 feet higher and buried in snow) for the following week. "You guys are going to drag Scouts up in this?" I said. "Poor kids." "Well, it's supposed to be 70 degrees next weekend," one of the guys told me. "Still," I said. "There's a lot of snow that's probably not going to melt." "Have you been up here before?" the other guy asked. "I have," I said. "It's been a while." I thought back to the last time I had actually been up on Lone Peak. "Probably not since 2002." And I realized that it really had been at least six years. Shortly after that, I discovered cycling, and the big mountains started to fall into the background. "Do you remember what the trail's like?" "Steep," I said. "Just steep. But beautiful. Are you guys going to try to reach the cirque today?" One of the guys just wrinkled his nose. "Probably not," he said. "We just want to go far enough to see where we're going." I hiked on ahead, along the Draper Ridge until the trail veered onto the steep face of the mountain. From there, the melting snow and mud made footing sketchy and difficult. Handholds were few and I found myself digging my thinly gloved fingers into the snow. Satisfied that the trail was no longer even hikeable, I turned around and looked out over the Utah Valley, the lake and the suburban sprawl that surrounded it. The city used to look so small. It looked massive to me now. The views had a displaced familiarity - a scene I had witnessed often but had let years pass since the last time. Dry air and relative boredom at 7,500 feet had become a foreign concept to me - and I almost laughed at loud at what a non-local I had become. Below me, the once-barren ridgeline of South Mountain was choked with new development - high-end homes, streets, and even a brand new LDS temple. But the terrain above my head was more stark, more rugged, and more appealing than I even remembered. It was like I was seeing a new world through old eyes, and an old world through new eyes, all at the same time. I ate a Power Bar and soaked in the views and a fair dose of cold wind, waiting to see if the two guys caught up to me. They never did. They had turned around even earlier, apparently abandoning the scouting hike and, I hoped, the ill-advised Boy Scout campout the following week. 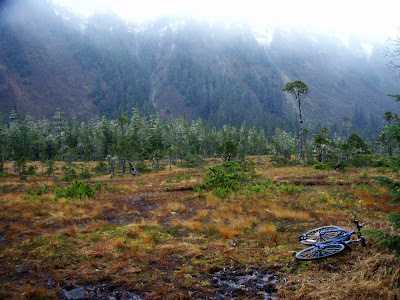 The next day, I would be on a plane bound for Juneau, back to low elevations and stifling cold humidity and wet trails that don't incapacitate a bike. Back to my home. 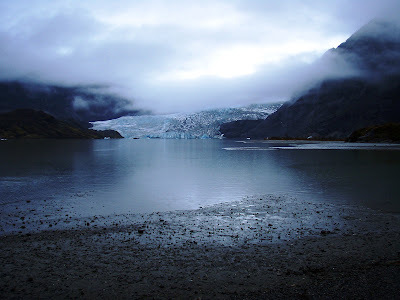 But there was a fear about returning to Juneau, about the possible twilight of my time there, and how I may never be able to look at it the same way. In the purple light of predawn, my dad and his friend, Tom, rushed to pull on every piece of clothing in their packs before the chill set in. I tilted my travel thermometer beneath the dim light of the South Rim bus station. It was 37, maybe 38 degrees. I was already wearing all of my clothing. Three years of Alaska outings have taught me to leave the house as pessimistic as possible and shed my way toward optimism. The shuttle bus pulled up at 6:08 a.m. Arizona time (what time is that in Alaska? What time is that in Utah? In a state that does not observe daylight savings, the real time was a constant source of debate.) The bus was packed to the brim with people - other hikers bundled in their Arctic best for the long descent down the South Kaibab Trail. It was a swift dose of reality that the Grand Canyon is not the place to seek solitude. But more than that, we were astonished at the sheer number of people undertaking what just a few years ago to us was a bewildering idea - hiking from one side of the Grand Canyon to the other in a day. But since those uneasy years, I had dropped off the rim three times. By the fourth, the edge had worn off a bit. I had become more accustomed to day-long physical exertion, and rarely on paths as well-built and luxurious as the Grand Canyon's main trails. But where the physical challenge dulled a bit, the wonder only sharpened. In the warm light of sunrise, a huge chasm spread out around us. Serrated rock and soft sand is a kind of scenery so different from that which I see in my day-to-day adventures. I appreciate its beauty so much more now that I'm so far away. My dad looked out over the trail snaking into the gorge and said, "this is one of those 'wow' moments, isn't it?" I smiled, because a love of sweeping spaces is something my dad and I both identify with. It reminded me that my dad and I share things that run so much deeper than bloodlines. After just a little more than an hour of hiking, we were already watching the blue-gray ribbons of the Colorado River flow toward the oasis of Phantom Ranch. I felt like we were moving at the speed of light. Tom, who had been up Mount Rainier but never down the Grand Canyon, said "Wow, I feel like we've walked a long way downhill, and we still have a long way to go." We skirted a narrow bridge across the Colorado River, elevation 2,400, at about 9 a.m. On the banks was Phantom Ranch, a little National Park resort with flush toilets and bunk houses and cold lemonade. We were still wearing half of our warm layers. My thermometer still hovered well below 60, in Arizona, in mid-October. I have visited that place at the same time of year when the temperature was in the 100s, and I have suckled the Phantom Ranch lemonade like it was the elixir of life. "You know," my dad said, "I don't really feel like a cold lemonade right now." And I realized with no small disappointment that I did not, either. As we continued up the surprisingly un-oven-like box canyon on the lower north side, we saw our only member of the large wildlife community that we met during the trip, a bighorn sheep. We also saw, to our disappointment, dozens of other hikers. We stopped for lunch at Ribbon Falls. I pulled out my assortment of Clif Bars and candy bars and tried to ascertain a good combination for lunch. My dad offered me a cheese bagel, with honey, and part of a can of Pringles - just like in the old days, when I was a grumpy teenager and my dad carried all of the food. The idea that he would still think of me when shopping for his hiking expedition made me feel warm and secure, and I relished in a lunch that still tasted as rich and nourishing as it did when I was 16. Ribbon Falls was just spectacular in the noon sunlight. We finished lunch and climbed up behind the waterfall, trying to dodge the mist that on any other October day in the Grand Canyon would probably feel wonderful. Ribbon Falls is about a perfect halfway point between the South and North rims. I think it should be a destination in and of itself. Crystal clear water over a ribbon of moss and vegetation as rich and green as anything in Juneau, contrasted against the red rocks. I would hike 24 miles out and back to see it. I couldn't decide which picture to post, so I posted four. Yup, still Ribbon Falls. A cold wind that had been blowing all day really picked up force as we ascended the North Rim. 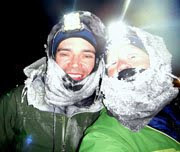 Gusts of 40 and sometimes even 50 mph blew away my hat and pounded us with chilling force. Luckily, the wind was almost always at our backs. Even on slow-moving feet, the push helps. I ticked off the elevation on my GPS, announcing the numbers to my dad and Tom as we marched upward. Fall began to return to the landscape. The thermometer dropped back toward 40. The climb is long, more than 6,500 feet over the course of the day, and the mileage - about 22 - is not a short stroll either. Even so, near the top, a part of me felt like we were just getting started, and GPS confirmed it. We had spent just a little more than nine hours in the canyon, with only about six to seven of that hiking (GPS accuracy is hard to pin down on moving time.) For the first time in four rim-to-rim treks, I could understand why people would turn around and walk back into the abyss. Clouds started to move in shortly after we crested the rim. By 5 p.m., it was snowing. But, all in all, we had an ideal trip. The weather was just about perfect - for my Alaska blood, that is. I was half disappointed I didn't get to see the snow while we were hiking. I imagine the canyon is beautiful dusted in white. So that's my fourth time down the Grand. Would I do it again? Most definitely.